A must-have with any Greek menu. The simple ingredients give this salad a really fresh, crisp taste. 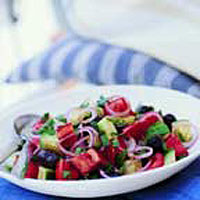 Place 1 red onion, finely sliced, in a bowl with 200g plum tomatoes, chopped, 1/2 cucumber, diced, and 100g Greek Kalamata olives. Drizzle with 2 tbsp balsamic vinegar and 4 tbsp Greek olive oil, season, then toss well. Serve in a large salad bowl topped with chopped fresh flat-leaf parsley.